Air Transat is showing some pretty great multi-city flight prices from Toronto to various cities in Europe for travel in June 2015. The key is the flight from Toronto (YYZ) to Dublin (DUB) on June 5th. Porto, Portugal (OPO) on June 12 or 15, the total price for both flights is $549, including all taxes. Update 1 - April 30 @ 7:20 PM EST - It looks like the cheaper Toronto-Dublin fares departing on June 05 have sold out. To get the lower overall price, you can try May 29 as your departure date instead. Returning From: one of the European cities listed above, to Toronto (YYZ), using one of the valid dates mentioned above. Newcomer airline Sky Greece is showing some late May, early June flights from Toronto to Athens or Budapest for $699 roundtrip including taxes. The available dates are very limited. They're not as cheap as when they accidentally loaded some pretty ridiculous prices back in March - but still a pretty great price. Their flight prices also include 2 pieces of checked baggage. Their flights to Greece are non-stop from Toronto. Update 2 - May 16 @ 2:50 PM EST - Some more dates have opened up at $699 roundtrip including taxes for Toronto to Athens, Greece. 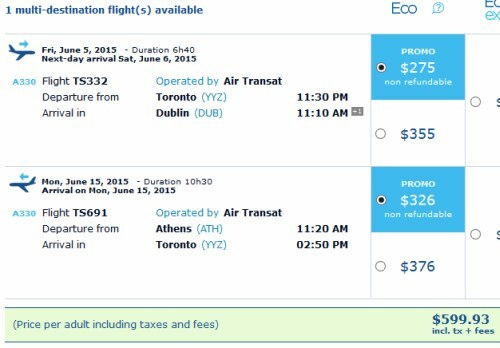 Tip from YYZ Deals Group member: "For better scheduling - we just booked toronto athens return athens montreal. Cant book that itinerary through website (it will charge you 2 one way flights - much more expensive) but call into the toll free number and agent processed it efficiently and for round trip price." For live discussion of this deal, or to get some amazing travel advice (to anywhere) from your 24,308 fellow travelers in Toronto, join us in the YYZ Deals Facebook Group. toronto, yyz, flight deals, europe, western europe, air transat, lisbon, portugal, lis, southern europe, central europe, italy, france, rome, fco, dublin, ireland, dub, eastern europe, athens, greece, ath, balkans, southeastern europe, porto, opo, budapest, bud, hungary, marseille, mrs and skygreece. 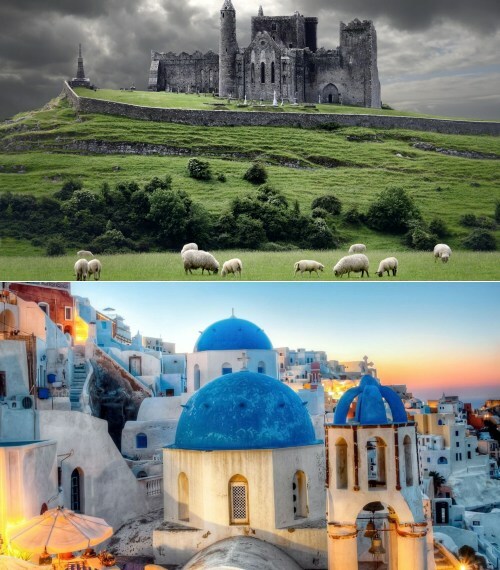 2 Responses to "Multi-city flights from Toronto to Europe in June 2015 | $543 to $599 roundtrip including taxes"
does AirTransat cover the flight from Dublin to Porto too in your example? No, it's up to the traveler to figure out their favorite way from Dublin to Portugal. So many possibilities!